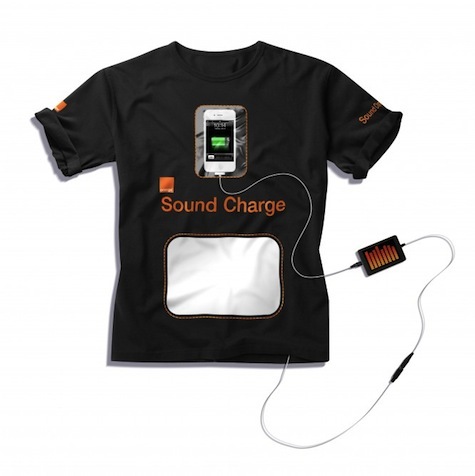 The Sound Charge t-shirt uses ambient sound energy - noise - to generate electricity and charge up your smartphone. The shirt uses piezoelectric film to absorb sound waves and convert them into electricity. The development team reckons that the t-shirt will generate up to 6Wh of power when exposed to sound levels of around 80dB - that's about the same noise level as a bustling city street and will not pose too much of a problem for Glastonbury Festival-goers. The Sound Charge t-shirts will undergo live testing around the Spirit of 71 stage, to see which of the acts prove most charge-friendly. "Sound vibrations, particularly bass frequencies, will create enough shaking to produce electricity from a material as simple as piezoelectric film," said Spirit of 71's Tony Andrews. "It looks like it could provide a real solution to mobile charging and I'm interested to see how the Orange Sound Charge performs in a live testing environment such as Glastonbury." I've always enjoyed combining clothing with electronics; see the sleeve communicator from Murray Leinster's 1945 short story First Contact for an early example. Now, noisy streets and loud clubs are just what you need - to recharge your phone.